The ideas for musicals come from the many places. Books. Movies. More movies. Far too many movies. Grey Gardens came from a documentary about a crazy heiress. [title of show] came from a festival application. 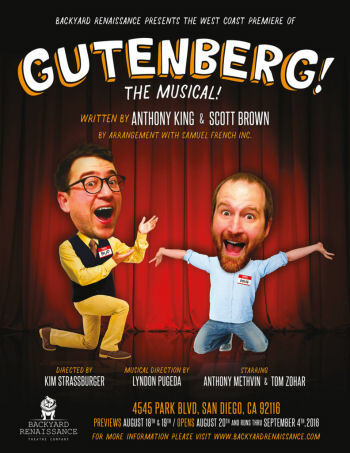 Then there is the show we saw last night from Backyard Renaissance Theatre Company (FB) at the Diversionary Theatre (FB) in San Diego: Gutenberg, The Musical! It came from, well, a slush pile of bad musical submissions. Perhaps I should explain this a bit more. Scott Brown and Anthony King (FB), who wrote the show, were Junior High School friends who were working as interns at theatre companies. They were tasked with attending new musicals, and reading through the slush pile of submitted musicals and unsolicited demo recordings of musicals. They were seeing bad musicals. Really bad musicals. They began to wonder how the authors of those musicals didn’t realize they were so bad. So, they decided to write their own intentionally bad musical. They would figure out the absolute worse subject for a musical and go for it. As Hitler was already taken, they went with Johannes Gutenberg, the inventor of the Printing Press. It died. They reworked it for Upright Citizens Brigade. It lived. They expanded it to 45 minutes, then to a full-length off-Broadway show. They recorded a cast album. I should say upfront that this show is bad. But bad in a good sense. Think about Batman in the 1960s. The show was bad but in an intentional way, in a way that played up the knowledge that you were in on the joke that it was bad, and so you went along for the ride, and it ended up being good, and in fact making a positive and deep commentary on a number of things. Well, perhaps not that far. But it was bad in an intentionally funny way, and that made it good. Here’s an example that perhaps illustrates this. Early in this show, one character is secretly in love with another character, and offers to make him some lamb stew. He replies, “I love ewe.”. She hears “I love you.” Yup. Do we go out on that joke? No, we do reprise of song, that help. But not much. In any case, Gutenberg, The Musical! is presented as a musical about Gutenberg. But it is not presented as a traditional musical. Rather, it is presented as a backer’s audition, with the two ostensible authors playing all the roles (in the spirit of Murder for Two). How do you tell the myriad of characters apart? Each character has their own hat. A baseball cap. With their character stenciled on it. As the story of Gutenberg himself doesn’t cry out for musicalization, the authors go the historical fiction route. They set the story in the fictional berg of Schlimmer, Germany. That should be a clue right there. They invent a fictional love interest, a buxom blond wench named Helvetica. They invent an antagonist, an evil (or should that be eeeeevil bwah ha ha) monk named, well, Monk. They invent a deep and meaningful commentary they want to make — since this is Germany, they must mention the holocaust. And they come up with a story: Gutenberg wants to make people read, and so invents the Printing Press. Monk wants to keep people stupid so he can tell them what is right and wrong without them knowing (and remember, boys and girls, that Monk almost rhymes with Trump). Helvetica loves Gutenberg, but is afraid of losing her wine-pressing job and him after he invents the printing press, and so falls under Monk’s spell (after listening to Trump’s, I mean, Monk’s, lies) and destroys the press. You can take it from there. So the story is campy. Intentionally campy. Aside from the hats, there is continual breaking of the fourth wall, continually skewering of musical conventions and existing musicals, inspired sillyness (such as the water schprizting bottle), and, well, everything you would expect at a bad backers audition. In doing so, Gutenberg does something similar to [title of show] — it exposes the side of theatre that is rarely seen: the developmental side. What Gutenberg is demonstrating is what many musicals go through, and what many potential producers have to suffer through: the backers audition that can be both great and horrifying at the same time. The badness of the musical proposal combines with the earnestness of the authors to create something bigger than itself. You might say that it becomes a monster in its own right, but I wouldn’t go that far … and here’s why. When you scrape off the veneer of bad backers audition, and think about what it being said, there is a deeper valid commentary being made (just as the wine press presses out the good juice from the grapes). The commentary has nothing to do with the holocaust, but with the importance of reading, knowledge, and independent thinking over just listening to the platitudes of misguided leaders. In the story, Monk intentionally wants to keep the village and the villagers stupid, so that he can exert his power over them by telling them what he wants them to think their books of authority say. Does that sound familiar? I’ve alluded to Trump before, because I think it is a clear analogy. We get political leaders who want to tell us what the Constitution says, what they believe our laws say, what they think we should do. Another example: I’ve recently been in some discussions with anti-Vaxxers (which will be my next blog post). They’ve been brainwashed by leaders who tell them what the science says, what the statistics means. Never mind whether it is true or not — these people tell them what they want them to hear to serve their own ends. Gutenberg, on the other hand, wants transparency and critical thinking. He doesn’t want to tell the people how to think — he wants them to be able to read and think about it on their own, to come up with their own opinions and understanding. He knows that what will make the true technological revolution is not a piece of machinery, but what that machinery enables. Beneath all of the camp of this musical is a deep message about the power of independent critical reading and analysis over the tyranny of ignorance. And that, friends, is a wonderful and true message. Now, a story is nothing if it isn’t performed well. Our two erstwhile authors, Scott and Anthony, well, Doug and Bud (as the characters are named) are played by Anthony Methvin (FB) [Doug] and Tom Zohar (FB) [Bud]. These two young men bring the right amount of earnestness, sillyness, and talent to the role, believably coming the authors of the musical. They handle all the different hats they have to wear well, rapidly becoming all the different characters. Including rats and dead babies. Also notable is the cat, Biscuit, whose bio is hilarious. I figure he has a big future on Broadway. The scenic design is understandably…. nothing. A piano. A folding table covered in hats, with a few props underneath it. This design, together with the simplistic props, comes from the Executive and Artistic directors of BRT — Jessica John Gerke (FB) and Francis Gerke (FB). The real “set” comes from the wide variety of hats, which serve as the “costumes” — which were also designed by Jessica John Gerke (FB). I’d say they were an inventive idea, but considering the cover of the cast album, my guess is that they were at least inspired by the original UCB design. Nevertheless, they were executed well and worked great for the story — and were incorporated well into the staging of director Kim Strassburger (FB) and the dance/movement of choreographer Katie Whalley Banville (FB). A little elaboration on that: although these were just two guys wearing hats, they were doing so in extremely inventive ways: such as a line of hats on a string for a chorus line, or literally wearing many hats at one time. There were commentaries on large dance numbers in musicals, on pointless charm songs, and much more — all executed in a humorous and entertaining fashion that wasn’t necessarily part of the script. That, I believe, is what the director and choreographer brought to this show. On to the piano. There is no explicit credit for the on-stage pianist, so presumably it was the music director Lyndon Pugeda (FB). It looks like him at least (although he needs to update his official website — it dates to 2012 and references (heaven forfend) Myspace). Although not a formal character, he played with the actors and provided quite a few humorous moments of his own. Plus he played the keys well. Back to the production credits. There was no credit for sound design; as there were no sound effects, there might not have been any sound design. Lighting design was by Curtis Mueller (FB), and worked within the restrictions of the space — a few lekos, a few scrollers, and what looked like a moving mirror spot. Then again, this was a backers audition — you don’t need a lot of lighting effects. Anthony Methvin (FB) was the producing director, and Taylor Todd (FB) was the stage manager. Backyard Renaissance Theatre Company (FB) is under the artistic direction of Jessica John Gerke (FB) and the executive direction of Francis Gerke (FB). Gutenberg! The Musical! continues at the Diversionary Theatre (FB) in San Diego’s University Park community through September 4th. Tickets are available through the BRT website; discount tickets may be available through Goldstar. It is worth seeing. ← Previous Previous post: Pre-Labor Day Sale on News Chum! Get It Here! New Low Price!